A condyloid joint (also called condylar, ellipsoidal, or bicondylar) is an ovoid articular surface, or condyle that is received into an elliptical cavity. This permits movement in two planes, allowing flexion, extension, adduction, abduction, and circumduction. 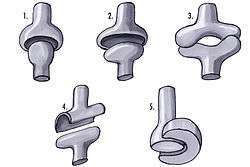 These are also called happy joints. Oval shaped condyle of one bone fits into elliptical cavity of other bone. These joints allow biaxial movements i.e. forward-backward and side to side but not rotation. Radiocarpal joint and Metacarpo-phalangeal joint are examples of condyloid joint. An example of a Ellipsoid joint is the wrist; it functions similarly to the ball and socket joint except is unable to move 360 degrees. ↑ Module - Introduction to Joints Archived January 16, 2009, at the Wayback Machine. Wikimedia Commons has media related to Condyloid joints.